For this recipe we like using Kamchun Asian pears, which are very sweet and have a slight nuttiness that complements the chestnuts well. Asian pears have a firm texture that holds up to heat and adds a textural element to the smooth filling. We like using an all butter homemade crust, but if you need to save time, a store-bought pie crust works just fine too. The last step calls for a brûlée torch, but you can also do this final step in your broiler if you don't have one. Prebake your pie crust according to its instructions. After baking, set aside to cool. Peel and core all your Asian pears. Very thinly slice just one pear into half moon shapes and set aside. Finely chop the remaining two pears (¼”-cubes) and place in small bowl and set aside. Place peeled chestnuts, half and half, corn syrup, nutmeg, and vanilla into a blender or food processor. Blend until smooth by pulsing at first, and scraping down the sides as necessary. Place the chestnut puree mix in a large mixing bowl. Using a whisk or fork, add the eggs and melted butter to the chestnut puree and mix until completely and evenly combined. Add the chopped pears to the chestnut puree and mix until evenly combined. Pour your chestnut and pear mix into the pie crust. 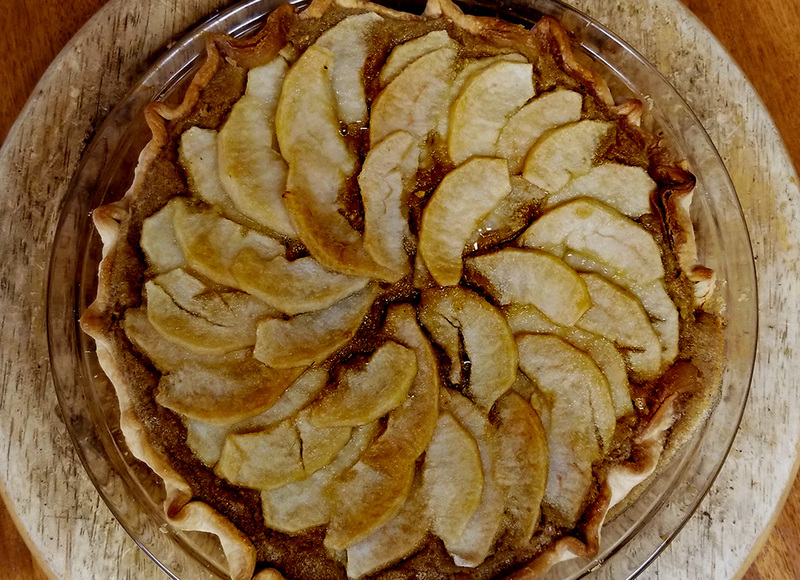 Place the remaining pear slices on top of the chestnut mixture, arranging them in a circular pattern to evenly and completely cover the top of the pie. Before serving sprinkle the sugar evenly over the tops of the pear slices. With a brûlée torch, evenly melt the sugar, remembering to move in small circles to prevent burning in one spot. If you don’t have a torch, cover the crust with foil and place in the broiler for 3-5 minutes, monitoring closely to make sure no spots get burned.